The state is divided into three different regions namely South-Western Punjab, Central Punjab and Eastern Punjab. Punjab is divided into seismic zones II, III and IV. The zones II and III are referred as Low Damage Risk Zone and zone IV comes under High Damage Risk Zone. 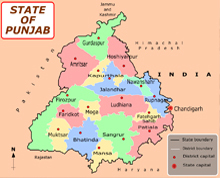 Punjab lies between the latitudes 29° 30' N and 32° 32' N and the longitudes 73° 55' E and 76° 50' E. The average elevation of the state lies at about 300 m from the sea level. Most of the land of the state is fertile. The state is located between the rivers Indus and Ganges. Most of the state is irrigated by canals. Rivers like Sutlej, Ravi, Ghaggar and Beas are the major rivers that flow through the state. Shiwalik Range, Hoshiarpur Choaland, Chandigarh Choaland are the major mountainous areas in the state. Different crops like beans, onions, carrots, oil seeds, rice, barley, buckwheat, wheat, sesamum, millet, cotton are being produced in the state. Harike Wetland is the lone national park in the state. Annual rainfall in the state stood at 915 mm.